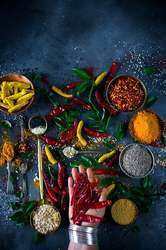 Our range of products include turmeric powder, herbs and spices turmeric powder 2.5% curcumin and steam sterilized turmeric powder. Turmeric comes from the root of Curuma longa, leafy plant in the giner family. The root (rhizome) has a tough brown skin and bright orange flesh. Ground turmeric comes from fingers which extend from the root. It is boiled or steamed and then dried, and ground. Odour / Flavour :- The odour and taste is aramatic. The product shall be free from foreign odour and taste such as mustiness or rancidiity. Turmeric comes from the root of Curcuma longa, leafy plant in the ginger family. The root (rhizome) has a tough brown skin and bright orange flesh. Whole turmeric comes from fingers which extend from the root. It is boiled or steamed and then dried, and ground. The odour and taste is aromatic. The product shall be free from foreign odour and taste such as mustiness or rancidity. Acid insuluble ASH 1% Max. Packaging 25 kg paper/poly bags. Turmeric comes from the root of Curcuma longa, leafy plant in the ginger family. The root (rhizome) has a tough brown skin and bright orange flesh. Ground turmeric comes from fingers which extend from the root. It is boiled or steamed and then dried, and ground. The odor and taste is aromatic. The product shall be free from foreign odour and taste such as mustiness or rancidity. Acid insoluble ASH 1% Max. Curcumin 2.5% to 5% max. Acid Insoluble Ash 1.5% max. We are the Leading Manufacturer, Supplier & Exporter of Steam Sterilized Turmeric Powder. Turmeric fingers are cleaned, ground and sterilized. 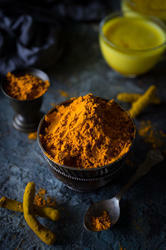 Turmeric comes from the roots of Curcuma longa, a leafy plant in the ginger family. The root, or rhizome, has a tough brown skin and bright orange flesh. Whole turmericcomes from the fingers which extend from the root. It is boiled or steamed and then dried, and ground. The odour and taste are aromatic. We can also offer steam sterilized turmeric powder. Mostly traded in whole form, it can also be processed into powdered form.